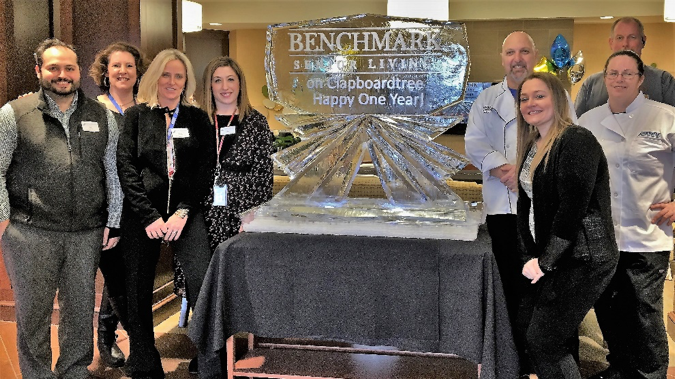 In January, more than 200 guests celebrated the first anniversary of Benchmark Senior Living on Clapboardtree, a growing and thriving community in Norwood, Mass. Residents and their families were joined by neighbors and potential new residents. Programming Director Nic Estrela, himself an accomplished musician, enlivened the atmosphere by arranging for a string trio in the lobby, a singer/pianist on the second floor and a string orchestra in memory care. Director of Dining Services Paul Marcello and his staff showed off their culinary skills at four unique food stations. A year ago, Marge, the community’s first resident, cut the ribbon at the opening ceremony. Today, Marge, with Programming Director Nic Estrela, is one of the community’s biggest advocates, known for her good suggestions and praise for “rock star” associates. From left, Nic Estrela, Resident Care Director Rebecca Royal, Director of Community Relations Patti Sullivan, Traditional Care Director Mandy Emond, Dining Services Director (and ice carver) Paul Marcello, Director of Business Administration Justina Lafreniere, Chef Maura O’Hara and Director of Plant Services Jeff Lutton. Clapboardtree rolled out the red carpet for its anniversary guests.